A landmark tower building with 24 hour access, strategically situated at the heart of this renowned business district which is fitted with top quality facilities and has phenomenal views over Paris. The centre has full disabled access and underground parking and is conveniently well connected with central Paris and the surrounding area as well as being close to a host of hotels, shops and restaurants. This high specification modern centre provides comfortable meeting rooms and well equipped offices with business assistance. The centre has its own internet café, secure car parking and state of the art technology. La Defence is a major European business district and is a strategically easy distance from both Paris and Charles de Gaulle airport. This is ideal for companies with international clients and for those that value accessibility and frequency. Beautiful, private mansion with one garden and private car park will amaze your clients. Ideally located near to Paris, just five minutes away from La Défense, you will enjoy a beautiful space to work and developpe your business. Offices come fully furnished, with meeting rooms and administrative services to ensure your company performs efficiently and effectively. Within walking distance, there are many local amenities to explore, from eateries to fitness centres. Next to La Défense this centre provides a variety of serviced offices in a range of sizes suitable for a range of businesses. As well as 24-hour access there is also convenient parking for you and your clients. This highly cultured area also has an abundance of green spaces in which you can relax during your lunch breaks, as well as a performing arts centre and an events venue for presentations and conferences. This fantastic centre is sensationally located in a prime area this business centre provides great access into the City and excellent transport links! Offices come fully furnished and are accessible 24/7. You can benefit from this space's 24 hour security, and postal facilities/mail handling services, both of which will enhance the prestige of your company. Within walking distance you will also find many bars, cafes and restaurants. 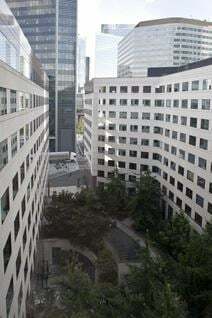 In the heart of the famous La Défense business district this business centre is well located for public transport links and the Quatre Temps shopping centre. The centre provides an excellent working environment with 80 spacious offices of varying sizes and 5 meeting rooms. Close by, you can find the Calder red spider, the Sculpture de Joan Miro, and the Fontaine monumentale. This highly cultured community also enjoys numerous sports complexes. Surrounded by fast, efficient transport links, this centre is situated in a busy, dynamic location. Members benefit from stunning views over the district’s businesses, hotels, and various local amenities. The modern centre has an abundance of amenities, such as friendly staff and spacious meeting rooms, to keep your business running smoothly. There are reception services that will greet your visitors. This ultra-flexible, well designed, furnished space offers its own bespoke three tier service; Resident, Traveller and Passport. It is perfectly located in the great area of Paris, on the 10th and 11th floor of one of the tallest, most distinguished towers of the city. You will be well provided with ultra-fast broadband, a fantastic break out space, meeting rooms for collaborative projects, and tea and coffee facilities for your convenience. There is IT support on-site, as well as mail handling services to help your business operate as efficiently as possible. The nearest underground station is Esplanade de La Défense and this is only a 4-minute walk away. As well as parking at the centre there is also a car park which is only a 2-minute walk away from the space! A fine centre that has a number of different amenities such as high quality meeting rooms , 24 hour access and security as well as a restaurant and a modern lay out. The centre would suit those who either have an established company or a new start up business. Flexible contracts can be negotiated as well meaning the best prices and length of terms can be customised to suit the business. The office is located in fine greenery but has the benefits of being close to a shopping centre as well as several bars and restaurants. It combines pretty scenery with urban advantages. Train stations and an airport are also close by. Opposite the famously striking Grande Arche this centre has a great deal to offer; not least a great location. This business quarter has become known for being one of the largest and most modern in Europe alongside being home to a notable percentage of top companies worldwide. Aside from superb views of the Grand Arche and exotic gardens there is a shopping mall beneath the centre that has an astounding range of shops and services. On the third floor of the building the centre offers 90 fully equipped offices and 3 meeting rooms, fitted offices are available from one month onwards with 1 to 20 workstations.